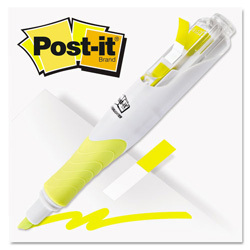 If you’re a professional that uses page flags and highlighters, why not get a professional highlighter that dispenses page flags? ReStockIt.com has a great highlighter and page flag combo that makes life easier for professionals who review or prepare signature areas on documents such as contracts. Right now, this pack of three is included in our President’s Day Blowout Sale for $9.62. This highlighter is designed to deliver a consistent steady flow, and provide page flags literally at your fingertips. You can use this marker to highlight important excerpts in a page or book, and then use the page flag to make that page easier to reference. This highlighter is available in different colors, including yellow, pink and blue. I’ve been using this highlighter on my computer reference books, and I can even write memos on the page flags with a permanent marker. Even if you don’t normally use highlighters or page flags in the course of your work, this item is the most convenient way to highlight excerpts in any literature that you refer to often.